Girls in Gis events are always different but always “successful”. We don’t measure the success of an event by number of participants, funds or donations raised sponsors, giveaways or the color of the belt of the host. The success of a GIG event is 100% measured by the experiences of our participants. None of that other stuff really matters. On Sunday April 21st, fifty-two females of all ages and skill levels came together at Girls in Gis San Antonio. $94 and four boxes of donations were collected for Family Violence Prevention Services and $96 was raised for United. Girls in Gis conducted a free self-defense event in support of Sexual Assault Awareness month. 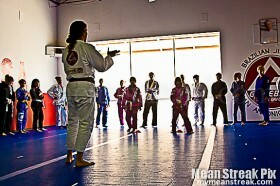 The training was led by Texas’s highest ranked female black belt, Fabiana Borges. This was the first introduction to the GIG experience for over half the participants and it won’t be their last. Also for several women, this was their very first experience with jiu-jitsu. Professor Fabiana Borges led the group though a series of team oriented warm-up games and exercises. The warm- up not only broke the ice, but led the way to creating a comfortable and welcoming environment, where everyone could let down their guard and have fun, and where girls could be girls. After everyone got to know each other, it was time for some drilling and self defense technique. It’s a rare treat to learn from experienced females like Fabiana, unless you’re lucky enough to be a student of hers at Gracie Barra San Antonio. Finally, it was time for some rolling which is everyone’s favorite! The GIG experience isn’t complete unless you make a new friend, leave with a smile and spend the afternoon laughing. No matter if it’s your first event or thirtieth, you are guaranteed to have a great time. Thank you to our upper belts for helping out. 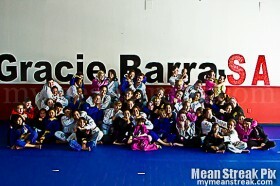 Thank you to Gracie Barra San Antonio for opening their doors to us and for the warm welcome. Also thank you Professor Fabiana for sharing your knowledge and leading the charge. Lastly, big thanks to all of you awesome girls for joining us and thank you for your generous donations. Together we are making a difference. See you at the next GIG on May 19th in Spring! Strength in Solidarity. ← Girls in Gis Patches on Sale!